Deviation is an amazing, courageous book by an amazing, courageous woman. It is not, however, the eye-opening book a reader might expect. The promotional material explains that author Luce D’Eramo “was a devoted teenage fascist in the waning years of WWII” who “decided with a stunning mixture of bravery and foolishness to leave [her Italian] home and volunteer at a German work camp. She was hoping to discredit the rumors she had been hearing” about Nazi atrocities. For most of the period from February until October 1944, D’Eramo worked at slave-labor factories at Siemens, I. G. Farben, and Dachau, until escaping from the last camp during an air raid. Four months later, when a building collapsed on her in Mainz, Germany, she was permanently paralyzed from the waist down. This autobiographical novel was written over a period of 30 years, published in Italian in 1979, and just now translated into English. The author died in 2001. With stunning detail and honesty, D’Eramo explores her physical pain, the unreliability of her memories, daily life in the labor camps, and the depths of inhumanity she encountered. “Martine wanted to know what the Italian girl had ever found good about Fascism. Without a more complete picture of D’Eramo’s upbringing—without any before-after comparisons of her political views—her descriptions of the labor camps, horrifyingly pungent as they are, become just another on the “Holocaust” bookshelf. Nor does D’Eramo give more than a couple of flicks toward the core of the Holocaust, the Nazis’ genocide against the Jews. 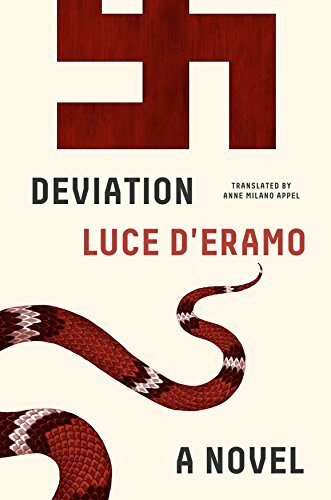 On its own terms, however, Deviation is a compelling book, written with a powerful immediacy. The first half of the book covers the author’s nomadic efforts to survive during the war’s last, freezing winter and her paralysis. Then, doubling back, D’Eramo describes her naïve and relatively less grueling months at Siemens and Farben. Finally, in one more re-doubling, she tries to dig up the memories she has repressed over the decades and analyze why she has trouble remembering. “I had based the recovery of my memories on a falsehood; therefore that recovery was also unsubstantiated,” she decides at one point. While D’Eramo never talks much about her political change of heart, she reveals some other motivations for her actions. She obviously felt a need to punish herself for her class privilege. After she is taunted by fellow prisoners at Siemens for the preferential treatment she is accorded, as a fascist volunteer from Italy, she decides to eat with the Russians and Poles—who, under the Nazis’ strict ethnic hierarchy, were treated worse than D’Eramo’s Western bunkmates. However, she won’t go so far as to join the Eastern Europeans in their more wretched dormitory. Another, albeit unacknowledged, motivation seems to be standard teenage rebellion. She frets at the prospect of a curfew, “home at sunset, my mother’s eyes aimed at the grandfather clock in the hallway if I was late coming back . . . not being able to go out anymore except accompanied by my mother, to those unbearable ladies’ teas like in Rome.” Hell no, Dachau has to be better than that! D’Eramo—whose essays and other fiction were praised by such literary giants as Alberto Moravia and Ignazio Silone—does not make it easy for her readers. In addition to the time shifts, she also switches the narrative from first to third person and alternates her name among various versions of Lucia. Although this is not the fully realized book it could have been, Deviation is well worth reading and an important addition to the Holocaust library. Fran Hawthorne is the award-winning author of eight books on business and public policy including Ethical Chic: The Inside Story of the Companies We Think We Love (Beacon Press, 2012) and Inside the FDA: The Business and Politics Behind the Drugs We Take and the Food We Eat (John Wiley & Sons, 2005). She has been writing about the nexus of business and social issues for more than 20 years for publications such as The New York Times and Institutional Investor magazine.